In the ancient Mediterranean, Roses were linked with Goddesses like Isis, Aphrodite, and Venus, who represented beauty, love, Springtime and fertility. The Rose motif proliferated in Early Christianity with the rise of Marian worship. The art of the Middle Ages depicts Mary with a Rose, rather than a scepter, symbolizing how her power comes from divine love. 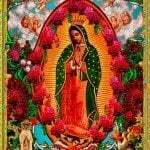 Our Lady of Guadalupe, the Virgin Mary of Mexican Catholicism, is often depicted surrounded by Roses. 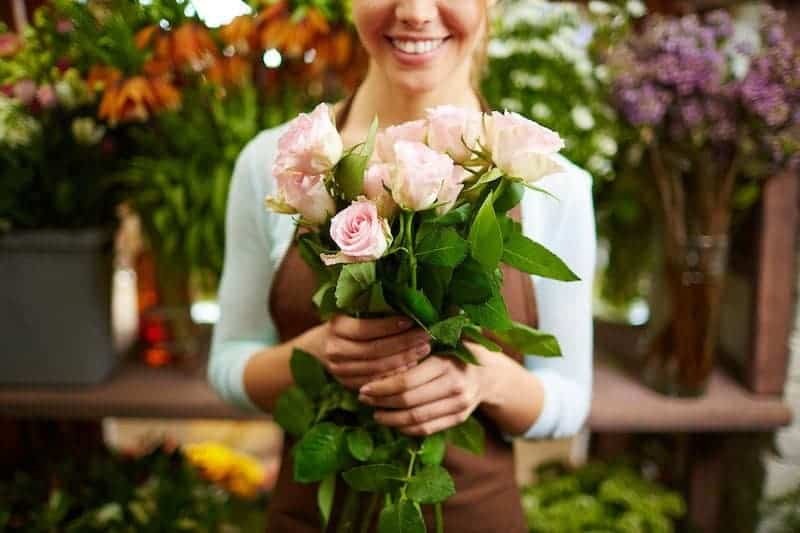 To this day, a bouquet of Roses is one of the finest ways to say “Congrats” after someone’s performance or achievement. Rose bouquets communicate respect and admiration. Roses are the national symbol of England, Catalonia and Islamabad, as well as the official flower of 4 US States. Confidence also refers to confidentiality. In alchemy, Roses represent secrets, mystery, and an oath of silence. In Roman myth, the angel Cupid offered a rose to the God of Secrecy as a bribe to keep quiet the frolics of Venus. In Ancient Rome, the practice of hanging a garland of Roses over a table meant that anything spoken at the gathering was to be kept sub rosa – confidential. This symbol lives on in the design element of placing a Rose-shaped ornament in the ceiling of dining rooms and council halls, signifying trust and honor for the meeting. Greek myth tells that Roses first became red when the handsome Adonis bled on them as he died at the teeth of a wild boar, allegedly sent by the Goddess Artemis. Christianity links the Rose with the blood from Christ’s wounds. The Rose also signifies martyrdom. Islamic legend associates Roses with the blood of the Prophet Mohammed. The thorns of the Rose symbolize love’s hardships. Black Roses, which are actually dark purple, symbolize death. The ancient Greeks also associated the rose with Dionysus, the God of wine, celebration and pleasure, in whose name debaucherous festivals were thrown. Legend has it that the Roman emperor Nero, notorious for his excess, dumped tons of rose petals on his dinner guests. Rose petals famously adorned the bedroom of Cleopatra when she courted Marc Antony. To this day there are few things more romantic than a bedroom sprinkled with rose petals. Bright red roses represent lust and romance. White roses signify purity and virginity. 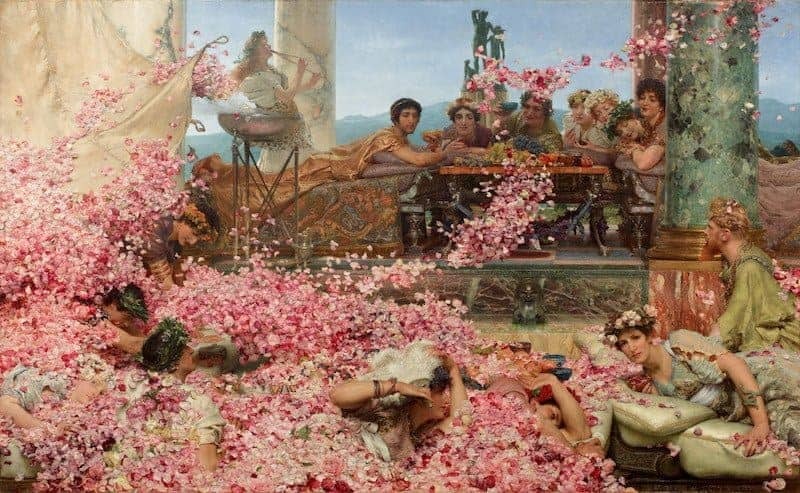 We love this 19th century oil painting portraying the decadent use of Rose petals in an ancient Roman banquet. A single red Rose represents the mystical center of a person – their heart, or true nature. In Islam, the Rose symbolizes the soul, flowering among thorns. Islamic art often depicts geometric Rose meditation gardens. Some Sufi Muslims anoint themselves with Rose oil during prayer. For Hindus and Buddhists, the Rose’s spiraling petals evoke the center of the mandala. We enjoy rose with our Rose Essential Oils, including Rose Otto, Rose Absolute and Rose Enfleurage. One of the best ways to experience the energy of Rose is to wear it round the neck in an aromatherapy locket. 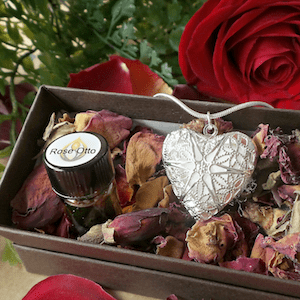 Get a free Aromatherapy Locket with your order of a half-dram bottle of Rose Otto essential oil as part of our Valentines Special.